Building muscle requires a combination of strength-building exercises and eating high-quality foods that are high in protein. Nonfat milk is a high-quality food, containing approximately 8 g of protein and 83 calories in 1 cup, according to the United States Department of Agriculture. Milk is also an excellent source of dietary calcium and vitamin D, if you choose enriched milk. To build muscle, you need to consume more calories than you expend. In addition, muscle requires more calories than fat as fuel for your body, so you need the extra calories as well as the protein to increase muscle mass. Calculate how many calories you need each day to maintain your current weight. The experts at MayoClinic.com provide a Calorie Calculator as an online tool. You can determine your base number of daily total calories needed. You will need to add calories to your base number in order to gain weight and will rely on milk to add those calories, along with protein. Also emphasize consumption of fresh fruits, vegetables, whole grains, lean meats and low-fat and nonfat dairy products. Eating well is the primary way to enhance the effects of strength-building exercise. Your body needs a full 3500 calories to gain a pound of weight, and you want that pound to consist of muscle mass rather than fat. Drink 1 to 2 cups of nonfat milk after every workout. ScienceDaily cites a 2007 study by McMaster University that found that participants who drank milk after a workout experienced more muscle weight gain and increased fat loss than individuals who drank soy-based beverages. The researchers speculate that milk may be the ideal supplement for losing weight and building muscle mass. This may be due to the essential nutrients that milk provides, aside from protein. Drink a total of at least 3 cups of nonfat milk daily, including the 1 to 2 cups you drink after every workout. This will add approximately 300 calories to your diet and 24 g of protein. According to Bodybuilding.com, you should aim to consume 1 1/2 g of protein for each pound of body weight daily to gain muscle mass. Drinking milk is an easy way to supplement the protein you consume in your foods. Weigh yourself on a weekly basis. Weighing yourself daily can cause frustration, because you may experience fluctuations in weight due to water retention or hormonal changes. Weighing once a week will provide you with an average that you can use to gauge your progress. Ideally, with the addition of approximately 300 calories of milk daily, you should aim for a gain of 1/2 lb. of muscle a week. Measure yourself weekly. Make a diary of the size of your muscles and monitor the changes in mass you experience. Adjust your workout routine if you aren't seeing results within two weeks. 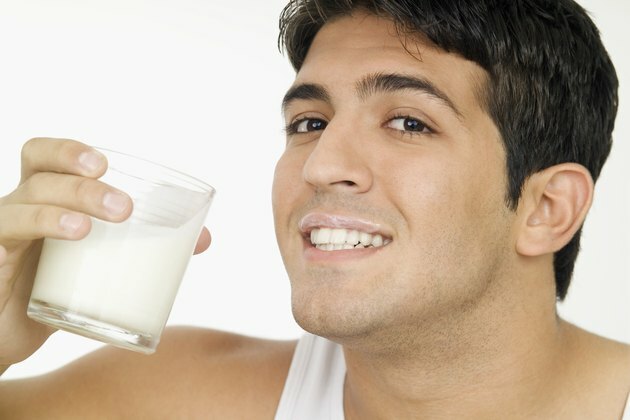 If you are a hard gainer and need more calories and protein to gain muscle, add an extra cup of milk to your daily diet. Check with your doctor before making dietary changes.